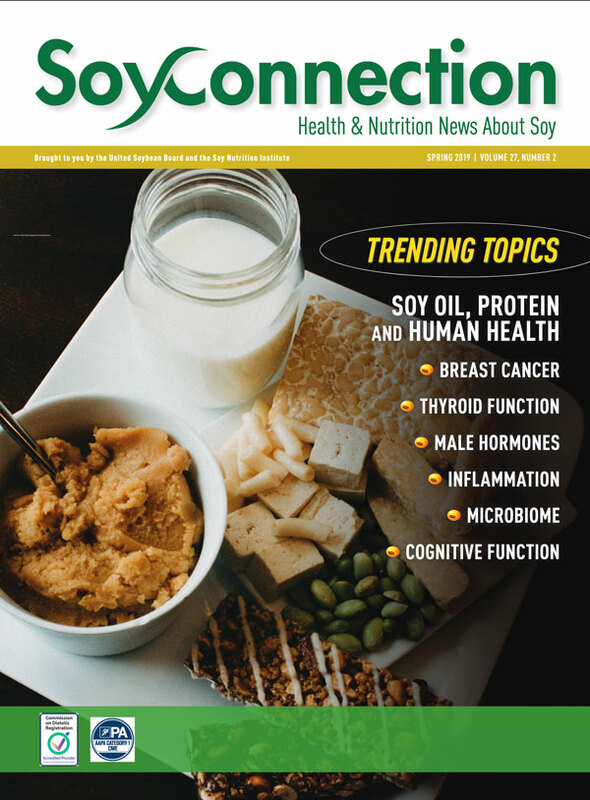 Soy Connection has been a resource for health professionals on the latest soy research for more than 25 years. Visit the Newsletter for Continuing Education Credits page to download the current newsletter and earn free CPE credits. Soyfoods and soybean oil play a vital role in health & nutrition for the entire family. Health professionals have long regarded U.S.-grown soybean oil, commonly labeled as vegetable oil, as a healthy cooking oil. Thanks to the Food and Drug Administration’s (FDA) July 2017 authorization of a qualified health claim confirming soybean oil’s ability to reduce the risk of coronary heart disease, consumers will now begin to see heart-healthy labeling on bottles of soybean oil. The new health claim that will appear on labels of qualified soybean oil and soybean oil- containing products* states: “Supportive but not conclusive scientific evidence suggests that eating about 1½ tablespoons (20.5 grams) daily of soybean oil, which contains unsaturated fat, may reduce the risk of coronary heart disease. To achieve this possible benefit, soybean oil is to replace saturated fat and not increase the total number of calories you eat in a day. One serving of this product contains [x] grams** of soybean oil." “Lowering intake of saturated fat and replacing it with unsaturated fats, especially polyunsaturated fats, like those found in soybean oil, will lower the incidence of cardiovascular disease.” Dietary Fats and Cardiovascular Disease, A Presidential Advisory from the American Heart Association, June 2017. U.S.-grown, heart-healthy soybean oil has a favorable fatty acid composition, containing 0 grams of trans fat and just 2 grams of saturated fat per 1 tablespoon serving. It is one of the few non-fish sources of omega-3 polyunsaturated fatty acids. The alpha-linolenic acid (ALA) found in soybean oil is the principal source of omega-3s in the U.S. diet. Omega-3s affect cardiovascular health and may reduce blood pressure. Soy is a complete protein, and soyfoods are rich in vitamins and minerals including folate, potassium and, in some cases, fiber. In the past 15 years, soyfoods have attracted the attention of research scientists around the world for health properties beyond basic nutrition as well. The FDA officially recognized the cholesterol-lowering effects of soy protein in 1999 with a health claim stating that 25 grams of soy protein per day may reduce the risk of heart disease. Most soyfoods are also low in saturated and trans fats, one reason why the American Heart Association has recognized soyfoods' role in an overall heart-healthy diet. Recent research suggests that soy may also lower risk of prostate, colon and breast cancers as well as osteoporosis and other bone health problems, and alleviate hot flashes associated with menopause. For more information on soyfoods and nutrition, visit the Soy Nutrition Institute website.